A process for treatment of sludge made up of saline organic solids or organic waste produced in a saltwater or brackish aquaculture system is described. The process includes use of a modified reactor, operating under anaerobic conditions, which yields methane from the digestion of the saline organic solids. 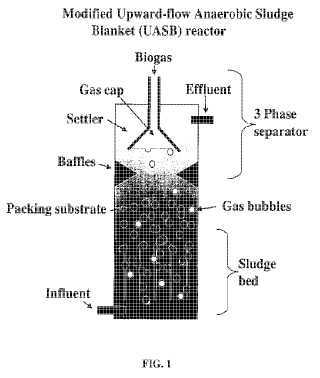 Modification of a traditional reactor to include a packing substrate provides for saline waste digestion not previously known. Additionally provided is a process for producing methane from the digestion of organic solids. Inclusion of and use of modified reactors in aquaculture systems is also provided.